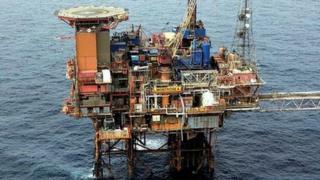 Oil company Talisman Sinopec has announced plans for 300 job losses from its North Sea operations. Talisman said 100 staff and 200 contractors would be affected, from a workforce of about 3,000. The company said it needed to take appropriate action to offset the declining oil price and increasing operating costs. BP, Shell, Chevron and Conoco Phillips have all announced reductions to their workforces recently. Talisman Sinopec managing director Paul Warwick said: "Our industry is operating in a mature environment, against a backdrop of a declining oil price and ever-increasing operating costs alongside falling production levels, reduction in exploration and asset integrity and maintenance issues. "We are not immune to those challenges and are taking appropriate actions to tackle them. "We have spoken with our workforce and are supporting them through the process."